N° 36. 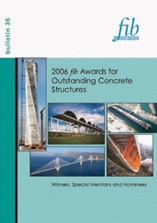 2006 fib Awards for Outstanding Concrete Structures. Bulletin (40 pages, ISBN 978-2-88394-076-5, May 2006). fib Bulletin 36 presents the structures that were selected as winners, special mentions and nominees in the 2006 edition of the fib Awards for Outstanding Concrete Structures competition. The awards are attributed in two categories, "Buildings" and "Civil Engineering Structures", and give international recognition to structures that demonstrate the versatility of concrete as a structural medium. Download Corrigendum 1 as a PDF file.